Readers of my last post on Metcash (MTS) will remember that my post began with my estimate of the intrinsic valuation for the company: $2.87 if EBIT margins remain at current levels and $3.62 if margins improve. You may be wondering, do I actually believe that this is “the” value of MTS? No, I don’t. It’s just my best guess given what I presently know about MTS. 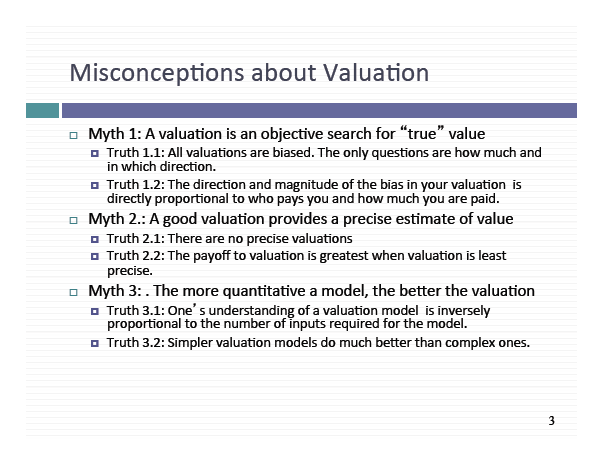 The truth is that no valuation will ever be “correct”. Valuations rely on assumptions and assumptions involve making guesses about the future. The future is both uncertain and unknowable. So my assumptions are very likely to turn out to be wrong and therefore my valuation will be incorrect. So why would I spend several hours researching and preparing a valuation that I didn’t really believe in, let alone publish it on my blog? Because the process of valuation is incredibly important. It makes us ask questions that will deepen our understanding of a company and provide important clues about its future prospects. Sales growth is modest and relatively stable from year to year. Because of this, consensus estimates of sales growth have proven to be reasonably accurate over time. So it is probably less likely that a large change in MTS share price will be caused by a large change in sales taking the market by surprise. MTS is a defensive company that has a low beta or sensitivity to the movements of the broader share market. Its cost of debt is also relatively low due to the stability of its business and its relatively high level of interest coverage. So it is probably less likely that a change in the MTS share price will be due to a large shift in MTS cost of capital. Profit (EBIT) margin has the biggest impact on MTS share price. It is the primary driver of change in MTS intrinsic value. Will in-store refurbishment increase sales and improve profit margins (assuming costs don’t rise by more than sales)? Will improved distribution reduce operating costs and improve margins? How long might this will take? Have other investors already recognized this? In other words, is the expectation of an improvement in margins already built into the share price? What could go wrong for MTS? The real “value” in a valuation comes from thinking about these types questions. They help us to invest with our eyes open. And we can only uncover these questions through valuation. Valuation is also important because its very difficult to stick with an investment unless we have some idea of its fair value. For example, let’s assume that an investor bought shares in MTS without first working out a plausible intrinsic value for the company. Our investor may “value” MTS by making comparisons using ratios such as price-to-earnings ratio, relative to MTS own history, to its peers, or to the boarder marker. Our investor has an indication of the relative value of MTS. Relative valuation can be useful, but it doesn’t really help to build conviction. It is an observation, but it doesn’t offer many clues that might help with an explanation. For example, what happens if the market rises, but the price of MTS remains the same. MTS is now even cheaper, in a relative sense, does this mean that our investor should buy more? Conversely, what if the market falls but the price of MTS remains the same and MTS is now relatively more expensive, does this mean that our investor should sell? In either case, we can’t be sure until we investigate what’s happening with MTS. In other words, we need an intrinsic rather than a relative valuation because only an intrinsic valuation forces us to consider the company-specific questions that need to be answered for us to have conviction. Why might a lack of conviction be a problem? Because it goes hand-in-hand with: short-term thinking, over-trading, buying high and selling low, not to mention paying more in trading costs and tax. All of which are enemies of profitable investment. Notice that I wrote conviction and not certainty. This is a subtle but important point. I wrote at the outset that it’s impossible to be certain because investment and valuation are all about the future, which is both uncertain and unknowable. By all means we should do the research to develop conviction, but we shouldn’t kid ourselves into thinking that anything is certain. You can download a copy of Professor Damodaran’s lecture notes HERE. Notice truth 1.2 – if refers to the principal and agent problem which I wrote about in an earlier post. If there are many investors valuing companies. And its possible to accurately value a company. Remember, if price = value, there’s no opportunity for profit as the true value of the company is already reflected in the price. Thus we are more likely to find opportunities for profit by focusing on companies where its difficult to come up with a precise estimate of value. Avoid all investments that involve uncertainty. This comes at a cost, since profits and uncertainty often go hand-in-hand. Remember, more variables = more guesses about the future = more room for error! We can illustrate this by returning to MTS as an example. Food and grocery retailing is a defensive industry. Revenues tend to be steady and they generally grow gradually over time (in-line with population or GDP growth). Its relatively easy to value such a company because it has stable margins and predicable earnings. Will the capital investment improve margins? if so by how much? How long will it take for there to be an improvement in margins? Will there be cost over-runs? Valuations are just biased guesses. Accuracy and certainty are impossible because nobody knows the future. Often the greater the uncertainty, the greater the profit potential. The answer is by learning to work with uncertainty. This will be the subject of my next post on philosophy and process. * If price = value then it’s impossible to out-perform the market. This is what academics mean when they say that the market is “efficient”. Notice the second part of our syllogism “And its possible to accurately value a company”. Remember, the only way to value a company with 100% accuracy would be to know what a company’s cash flows would be in the future. And since nobody knows the future, how can it be possible for markets to ever be fully efficient? ** This is why a crisis can be a great time to buy high quality stocks. Ordinarily these stocks aren’t cheap, as the market usually recognize their value easily – due to their relatively stable sales, margins and earnings. However the fear and uncertainty created by a crisis often results in high-quality stocks trading at a significant discount to their intrinsic value. A classic example of this is Warren Buffet’s investment in American Express after the Salad Oil Scandal.